A fan favorite for decades. Our numerous features and options give you pick’em football at its finest. Create an NFL pickem or College pickem football league or join an existing league today. Each week you pick a winner for every game. You get one point for each win. The player with the most points during the week wins the week. The player with the most cumulative points after the Super Bowl wins the league. Easy pick sheet to select teams, including quick pick option to select all home teams or favorites. Standings page that includes win/loss pct, total points, trend graph, and player's picks for the week. Comprehensive, life-long stats on your pick'em league and your individual performance. Possible inclusion in the Pickem Hall of Fame and Hall of Lame. Setting the pickem pool to be straight up or against the spread. If against the spread, the line can be set to variable (player gets the line at the time of his pick), or fixed (all players get the same line). Specifying your own point values for post-season games (for example, you can set playoff games to be worth twice as much as regular season games). Specifying an exact number of weekly pickem games to pick (default is all games). Run a Pick 5 football pool, Pick 10 football pool, etc. Configuring a "jackpot" that builds each week using a % of player fees, that triggers when a player wins a configured number of games in a given week (e.g. 7 for a "Perfect 7" pickem league). Optional "Key Games" feature where players are awarded extra points for games they pick correctly that they had check-marked as a key game. Configuring your league to be a weekly football pool. 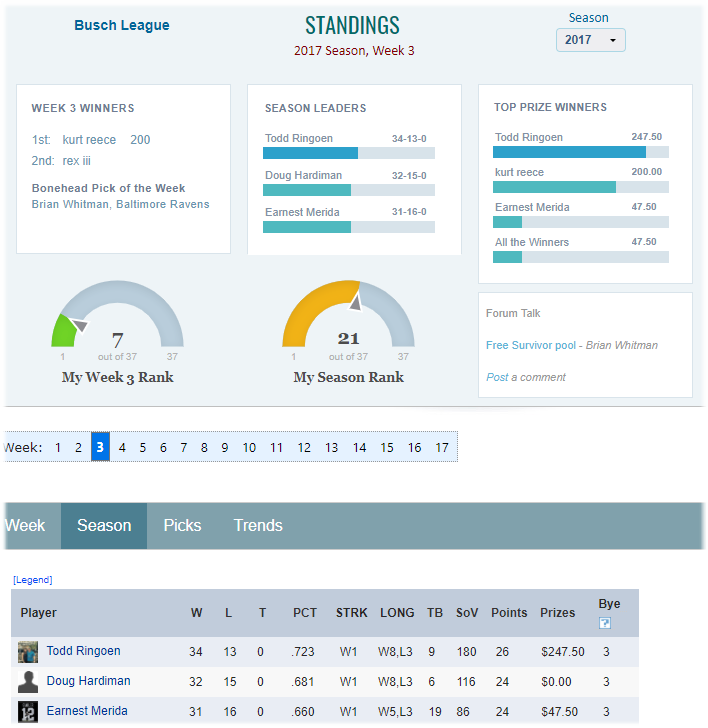 The Standings page will default to the week's standings instead of the season standings. Allow your players to use up to 8 clones to make picks to increase their chances of winning. Specifying weekly pickem prizes from 1st to 3rd place. Specifying final season prizes for 1st through 4th place, best total tie-breakers, and best overall Strength of Victory. One custom prize, where you name the prize and set the winner when appropriate (for example, "highest weekly pick em total"). "Bye" week feature that allows a player to forget a week in the pick'em pool and not be hopelessly out of contention. If enabled, the worst regular season week for each player is subtracted from their total points (only total points are affected, other stats such as win-loss record remain intact). The football pool's Standings page will indicate the bye week determined for each player. Optional AutoPick feature that generates picks for players who missed the deadline. Tracking of player league fees and per-player note annotation (e.g. "this player gave me a check on Tuesday"), and optional notification to the player when they log in to the site if they have a balance due. You can also configure your pickem pool to be weekly, where weekly cost for a player is updated only for those weeks they submit picks. Set up your league to accept credit card payments for your league fee. This requires you to set up a PayPal free business account that you can link to your bank. Office football pool branding - add your own logo and background colors to your league. You also get your own branded login page.